While you are waiting for the tutorials to start here, feel free to visit these wonderful bloggers and get to know them a bit better. 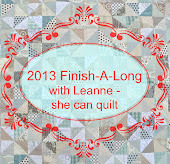 Please link one blog post or flickr picture for each finished item. If you like, you can link up older blog posts where you first showed off your finished item, you do not have to write a new post for each finish. It is nice to see one end of quarter post letting us all know how you did overall, so feel free to use this post to link one item and then link older posts for the rest of the finishes. Please ensure that at least one your end of quarter linked posts contains a link to your original Q1 FAL list so that I can check to make sure your finishes are of things on your Q1 list. It is even easier for me if all of the linked posts link to that original Q1 list. If you are linking flickr photos, add a link to the originally linked flickr photo in the photo description. And yes, I do check, Rhonda can be a bit of a taskmaster you know. No, but I hope that if you still have any UFOs around you will join us for Q2. Do things I finish in the first week of April count? As long as you link up your finishes before the post-quarter link closes on April 7, I will count the finishes. Consider those extra days as bonus days or a little buffer just because. Can I do a tutorial in a coming quarter? Please email me (shecanquilt [at] gmail [dot] com) or leave a comment on this post if you would like to propose a tutorial. I have lots of open slots and need your help. How else can I support the FAL? Take some time to visit some or all of the Q1 finish links and leave comments. Also continue your wonderful support of everyone on the FAL flickr group. Join us for Q2 with more UFOs. Remember that they need to be started projects to qualify, not just plans and ideas. Support our lovely sponsors and consider dropping them a line or leaving a comment with your next order thanking them for their FAL prizes and support. When are the next link-ups? Sunday April 7 - the Q1 post quarter link up closes at midnight, mountain standard time. Monday April 8 - The Q2 pre-quarter link up opens - you can start posting your Q2 list of projects to finish in the quarter. Monday, April 15 - The Q2 pre-quarter link closes at midnight mountain standard time. Sunday June 20 - the Q2 post-quarter link will open. And I will post the other dates later on. Since there are no pictures, here is a photo from instagram of my pickle dish progress last night - I have made 37 of 200 pickle dish units (one "half" circle is a unit to me) and have 163 to go. This quilt is going to be so good I think. Looking forward to those tutorials! And I may just be able to join in the next quarter- I'd like to have my pickle dish finished! The tutorial list looks like it's going to be fun - I've been meaning to make a block book for a couple of years now so I'm looking forward to Monday's post. And I definitely need to pay attention to Thursday's post, and take copious notes! P.S. Thanks for the link up clarification, I think I know what I'm doing..! Such a fun week filled with great tutorials to look forward to! Happy Easter Leanne!! These are really helpful details. Reading them I realize that I included in my 2013 FAL Q1 goals two of the nine items that shouldn't have been listed since they weren't started yet. The bright side is that six of the seven qualifying projects have been finished and that's a better batting average than my FALs from last year! The pickle dishes are lovely, but what a daunting task - 200 of them! Whew. So much to keep track up! Need to check on my own lists! Looks like a fun list of tutorials. Love your pickle dishes, wow that's a few more to go! Those pickle dishes are looking good! I was happy to see on IG that you are paper piecing them. Gave me a bit of a fright there that you were cutting all those weensy little arcs and seaming them all together. Okay, I think I've got it down on the FAL stuff. Hope I do. Happy Easter Leanne. I've got my work cut out for me to link up my finishes. It's a busy week. Thanks for hosting this finish along. I can't find the link for the closing of the first quarter?